This last weekend, I had a chance to go to Chicago, see some old friends, and participate in the Byzantine Studies Conference. I heard some excellent papers at the BSC including one on the monastic clothing in Byzantium, the historical and linguistic bases for Catholic and Orthodox conflict (with the hope for better modern dialogue), mathematics in Byzantium, a new theory on the theme system, and an iconoclastic paper redating the Arab conquest of Syria. Diana Wright, fellow blogger at Surprised by Time, gave an excellent presentation about the throne room in Mistra, arguing convincingly from documentary and archaeological evidence for a Venetian commission and production. In my own paper, I gave the 9th century Byzantine admiral, Niketas Ooryphas, another spin. If you followed this blog back in January, I ran a series of posts on Niketas (I, II, III, and IV) based on a paper written for the annual meeting of the Archaeological Institute of America. In that paper, I tried to separate Niketas from the other known porters of ships over the Corinthian Isthmus in the Greek and Roman world. I was trying in that paper to problematize the conventional interpretation of the diolkos as a kind of less efficient “ship canal” of the premodern world. On the other hand, in this paper written for Byzantinists, titled “Basil’s Thunderbolt: Niketas Ooryphas and the Portage of the Corinthian Isthmus,” I strayed from the diolkos and tried to place the legend of Niketas portaging the Isthmus into its Byzantine literary and historical environment. Niketas is a heroic figure in the Life of Basil who knows devices and tricks like no other. The best example is the portage over the Isthmus. But he is also a most troublesome figure of Byzantine history because he punishes his enemies in awful ways by, for example, flaying them alive and dipping them into boiling pitch. Because the narrator relates these punishments to religious faith (both Christian Orthodox vs. Muslim, and Christian Orthodox vs. Christian apostates), Niketas represents a kind of inverse of the accounts of the martyrdoms of Christians by emperors and provincial governors in the 3rd and early 4th century. 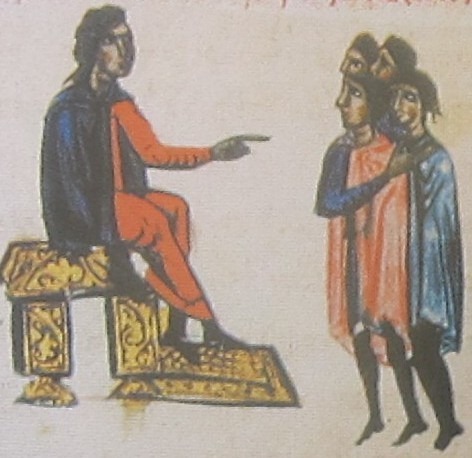 Part of an illustration from the Madrid manuscript of John Skylitzes’ Synopsis of History showing Niketas Oorpyhas casting judgments on Christian apostates. One rewarding discovery of my research is recognizing that much of what we know about Niketas is legendary. The portage of the Isthmus is entirely a legend, and I do not doubt that the horrific punishments themselves have been invented to make the Emperor Basil appear mightier than he was. I hope to demonstrate this by developing the piece into a little article in the future. In the meantime, here’s the web version of the BSC paper, stripped of its notes. I think that the portage of warships over the Isthmus could have taken place during Niketas’ time. Being an unusual event, it was documented by contemporary historians, who of course exaggerated the number of ships and the time it took. We should also bear in mind that the fleets of the period comprised not only of great galleys (the famous dromones) but of a variety of smaller vessels, most suitable for the raids and skirmishes against pirates, possibly like the small galleys discovered at the Yeni Kapi harbor of Istanbul recently. These ships were considerably lighter that the ancient triremes and could have been relatively easily hauled over the Isthmus by Niketas’ crews. Yannis, thanks for the response. I don’t doubt that it could have occurred, but don’t see any reason to believe that it did occur. I’m pretty suspicious of this one, but mainly for reasons that have to do with intellectual context. The entire account of the portage is unbelievable in its current form, and the life of Basil itself contains a number of outright fictions. The author is clearly tailoring the story in awareness of ancient history. This doesn’t prove that the event *did not* occur, but it could not have occurred in the manner in which it was told. I’m not sure that we can answer the question of whether there is an historical kernal of truth to the story.